Human activities in the marine environment result in multiple pressures. Two of the most obvious pressures on the southern North Sea sediments are “hardening” and “fining”. “Hardening” mainly results from the installation of offshore wind farms, where foundations provide a hard substrate for a diverse underwater fauna. Fining of sediments, on the other hand, can be considered an important integrated effect resulting from multiple human activities, mainly aggregate extraction, beam trawling, dumping, as well as the introduction of artificial hard substrates. Both pressures are expected to have important implications for biogeochemical cycling (e.g. N-cycling) and food web structure (e.g. secondary production). FaCE-It aims at understanding the impact of fining and the hardening on the benthic ecosystem functioning (i.e. 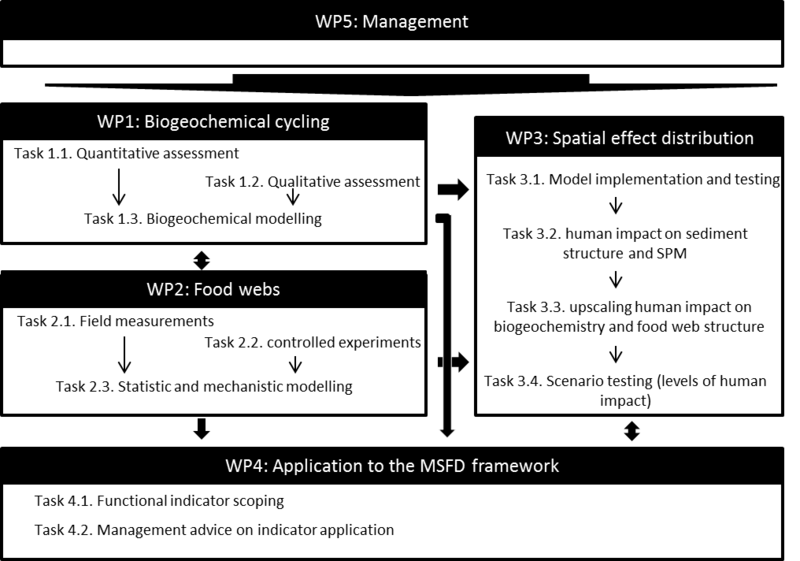 biogeochemical cycling and food webs) from the local scale to those larger scales in which managers are interested in for the implementation of the Marine Strategy Framework Directive. FaCE-It will contribute to the estimations of MSFD descriptors related to ecosystem functioning and in particular descriptors 1, 4 and 6. FaCE-It will investigate biogeochemical cycles (WP1, leader UGent) and food webs (WP2, leader RBINS-OD Nature) in a range of natural and anthropogenically disturbed sediments in the Belgian part of the North Sea (BPNS). The sites affected by human activities either have fined sediments (resulting from e.g. fisheries or aggregated extraction), or are impacted by the presence of hard substrates. The observed processes will be scaled up from the local sample scale to the scale of the entire Southern Bight of the North Sea and several scenario’s will be modelled to assess the cumulative effect of the planned human activities at this regional scale (WP3, leader ULg-MAST). Our findings will finally lead to the development of functional indicators in the framework of the Marine Strategy Framework Directive (MSFD; WP4, leader ILVO).